In 1495 the Florentine painter Filippino Lippi created this painting for the altar of the monastery belonging to the Barefoot order in Palco near Prato. The work is typical of that era, produced in the years just prior to the High Renaissance when Raphael would come to play the leading role. Its composition is well organized and clear, and displays a lively symmetry. Notice, for example, how the main figures on the right and left are posed in symmetrical-reverse positions. This could have resulted in the action rotating simply around a central point, but that effect is counter-balanced by a background landscape which actually stretches out from right to left, moving towards the rocks on the left. The function of the little tree, which draws our attention because of its prominence, is to restore the symmetry which otherwise perhaps would have been lost. It is placed equally far to the right of the center as the steep rocky cliff is placed to the left of it. The painting is precisely painted without becoming overly fussy, in a naturalistic style, which means that the artist has attempted to reproduce reality as carefully and accurately as possible. The poses of the figures are based on careful study and sharp observation and are anatomically correct down to the tiniest details. Take special note of the way the garments fall; they serve to accentuate the movement and posture of the main figures, but at the same time are rendered as naturally as possible. The landscape too is exceptionally beautiful. We notice some influence of Flemish painting, which had risen to great heights with respect to landscape painting. The Florentine artists will undoubtedly have studied carefully the huge Portinari altar by Hugo van der Goes, which had been in Florence for twenty years already, and they would have paid special attention to the gorgeous spread of the landscape in it. In true art, form and content are inseparable. We will notice how all the aesthetic elements just discussed are combined to form a unity between the representation and the statement that is present in the painting. You have probably been wondering what this painting is trying to say, what story it is portraying. It is actually not depicting a particular story from the Bible, an apocryphal book or a legend. Despite the exquisite detailing and the artist’s efforts to make everything look as natural as possible he was not attempting a sort of photographic report of an actual event from the past. Rather, what we have before us much more resembles a theological discussion or argument. In the center, in the valley just to the left of the tree, we see a group of kneeling figures. They are looking prayerfully up in the direction of the woman on the right, Mary, the mother of Jesus. These people are pleading with her to pray for the salvation of their souls. She seems to be straining her ears, her head inclined towards them slightly, while with her hand she is gesturing to her Son, who is kneeling on the left. Her left hand shows him her breast, thereby reminding him that she is his mother. And, to cite a Roman Catholic apologist: the expression ‘Mother of God’ encompasses all the greatness of Mary and elevates her far above all other human beings. Because Mary is the Mother of God, she resides in heaven, closer to her divine Son than any of the other creatures, angels, and saints. She shares in his glory and it is her special privilege to distribute God’s grace in Jesus’ name to human souls. She is the ‘Mediator of all Grace’, because it was God’s will that Jesus, the source of all mercy, came into the world through Mary. According to the same apologist, it is fitting that Mary has a part in the distribution of the grace which Jesus earned through his death on the cross. After all, she became the Mother of Jesus because of her freely spoken ‘Yes, let it be with me according to your word.’ Freely she concurred with Jesus’ sacrifice, experiencing it along with him as she stood below the cross with her bleeding heart. Thus, Mary, albeit in a subsidiary way, had a part in bringing about our salvation. Now we understand why in the upper right and left corners of the painting Mary and the angel of the Annunciation are to be seen. It reminds us of her merits on the basis of that freely spoken yes-word, giving her the right to become an intercessor for others. To the left is Christ. His head is inclined toward his mother, but his gaze is directed towards God the Father standing in the center at the top. With his left hand Christ points to the wound in his side, a reminder of his crucifixion. With his right hand he makes an imploring gesture. Upon which God the Father with a gesture of blessing offers his merciful forgiveness of sins to the souls who are being prayed for. Carrying this idea further, we see how Christ takes this grace that has been poured out and with his blessing offers it to the believing observer. 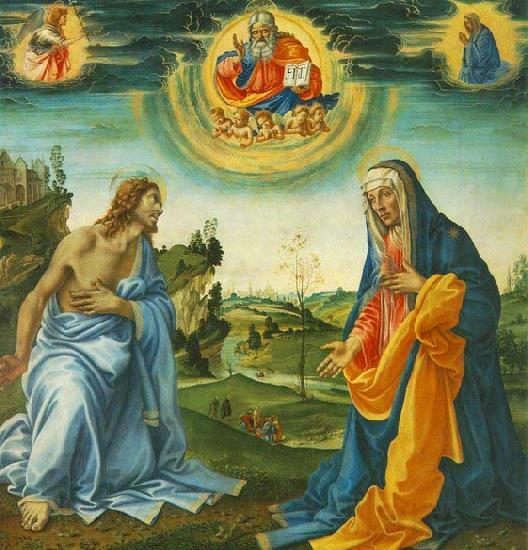 A similar duality can be seen in Mary’s right hand. It now has become clear that this painting constitutes a theological argument or, in other words, a sermon. It is a discourse intended to offer us comfort. Filippino Lippi: The Intercession of Christ and Mary, 1495, oil on panel, 156 x 147 cm. Alte Pinakothek, Munich. Filippino Lippi (c. 1457-1504) was probably born in Prato in 1457 following the elopement of his father Fra Filippo Lippi and Lucrezia Buti. After his father death in 1469 Filippino entered the workshop of Botticelli. A Milanese agent in Florence reported in about 1490, ‘Filippino: a pupil of Botticelli and son of the most outstanding master of his time.’ Filippino's fame spread throughout Italy and he painted major series of frescoes in Rome as well as Florence. He was also a renowned painter of altarpieces, receiving commissions from Milan, Bologna and Genoa. Perhaps through the historical misfortune of being eclipsed by the next generation, in particular by Raphael and Michelangelo, Filippino's contemporary success, greater than even that of his teacher Botticelli, is now forgotten. He influenced the artists of the High Renaissance and can be seen as a link between the achievements of the 15th and 16th centuries. H.R. Rookmaaker (1922-1977) ) was the founder of the History of Art Department and Professor of Art History at the Free University in Amsterdam, the Neherlands. For more of his articles and more information about him, go to http://www.artway.eu/content.php?id=63&lang=en. Originally published in Dutch in Stijl 1, 1, 1952. Published in English in M. Hengelaar-Rookmaaker (ed. ): H.R. Rookmaaker: The Complete Works 4, Piquant – Carlisle, 2003. Also obtainable as a CD-Rom, see piquanteditions.com/product_info.php.